Carrot cake is one of the most genius pieces in the baking world. It is soft, juicy and tasty, and contains carrots in its dough. The first carrot cake was inspired by the favorite medieval dessert, carrot pudding. Many times in history, when sugar was hard to come by and even impossible, people used sweet vegetables to make desserts. In World War II, the British government allocated a very small amount of sugar products to the residents, so the popularity of the carrot cake that each carrot can grow in the garden has increased greatly. Carrot cake also appears in comic context and jokes. Such as the joke about the rabbit entering the bakery on Sunday and asking, "Do you have carrot cake?" The seller says no. On Monday he comes in again and asks, "Do you have carrot cake?" And again the seller answers his no. And so on Tuesday, Wednesday and Thursday. In honor of Friday, the seller decides to make a surprise for the rabbit. He asks the shopkeeper to make a carrot cake for the rabbit. And indeed, on Friday the rabbit enters the bakery and asks, "Do you have a carrot cake?" "Yes!" The seller enthusiastically answers. Rabbit says: "Isn't that icky?" How to celebrate Carrot Cake Day? 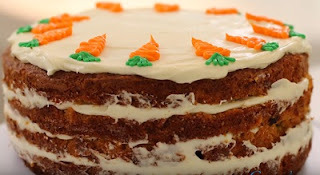 For Carrot Day, you can visit your local bakery and buy a carrot cake. You can make a carrot cake easily according to the recipe on the link. No matter where you get a carrot cake, today is the day to eat it without guilt and enjoy every crumb.